Shirts With Random Triangles: Butch Jones did not ride on Brian Kelly's coattails. Because Butch Jones said so. Butch Jones did not ride on Brian Kelly's coattails. Because Butch Jones said so. Butch Jones styling the popped collar. Photo via SB*Nation. New Tennessee head football coach Butch Jones, has had an odd career trajectory before arriving in Knoxville. His previous head coaching jobs at Central Michigan and Cincinnati, both times replacing current Notre Dame HC Brian Kelly. Needless to say, that's led to criticism that Jones' success at both schools owes a lot to Kelly. Jones, of course, disputes this argument. "I think it's accurate that I've followed him," Jones said. "I have a tremendous amount of respect and he's a very close friend of mine, but I think that's the furthest thing from the truth. I think he'd tell you that, too. Every team is different, and every team has its own personality. You look at the body of work. You look at the amount of newcomers that played for us. "I can't concern myself with that. All I know is we had two great places, and we were very fortunate to win four championships in six years. I don't think that happens by mistake, but I can't concern myself with that. 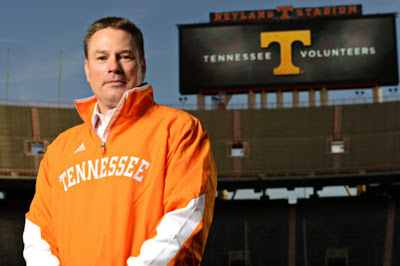 The only thing I can concern myself [with] is rolling my sleeves up and making the University of Tennessee football program the best possible football program we can." Jones can disprove at lot of this argument by succeeding at Tennessee, a program where fromer HC Derek Dooley had nowhere near the success that Kelly had before Jones took over.